Interact was originally designed by 8vo in 1994 as part of an invited submission to the American Center of Design Journal. 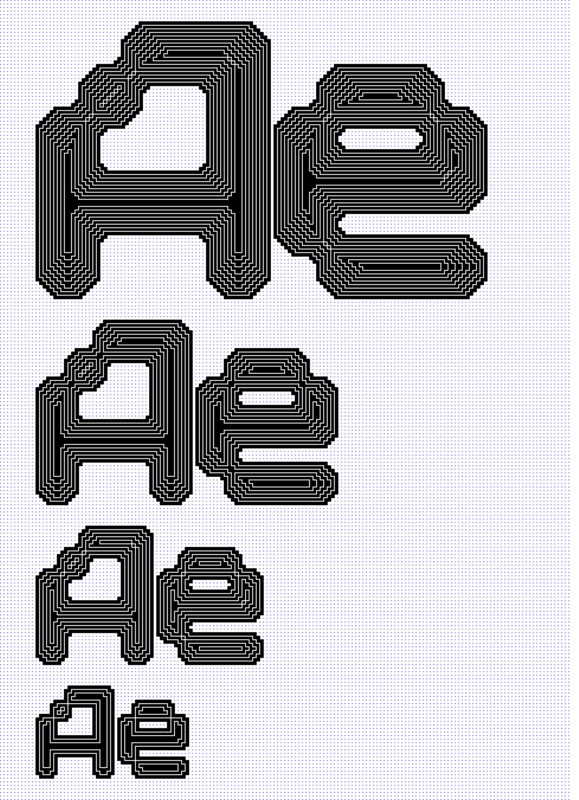 It was first implemented as a system of grid-based bitmap typefaces, in lowercase characters only, for screen use. Taking as a starting point the optical characteristics of the stroke junctions in Wim Crouwel’s ‘vormgevers’ lettering of 1968, Interact employs horizontal and vertical lines as well as 45-degree pixel steps to modulate a set of stroke junctions which have the effect of optically rounding the letterforms. Interact has now been extensively expanded and revised by MuirMcNeil as a system of 23 typefaces in 4 scaleable groups with a comprehensive range of 12 calibrated weights. A complete set of capital letters, punctuation marks and accented characters for Western European languages have also been added. The MuirMcNeil Interact typefaces follow a mathematical progression in which type size hierarchies are scaled in exact proportion to a constant pixel resolution. There are four resolutions in the Interact system: 06, 04, 03 and 02. These numbers refer to the scale ratios of the bitmap contours. When used in size relationships which are relative to these proportions, the bitmap contours of the type will occupy a consistent grid.